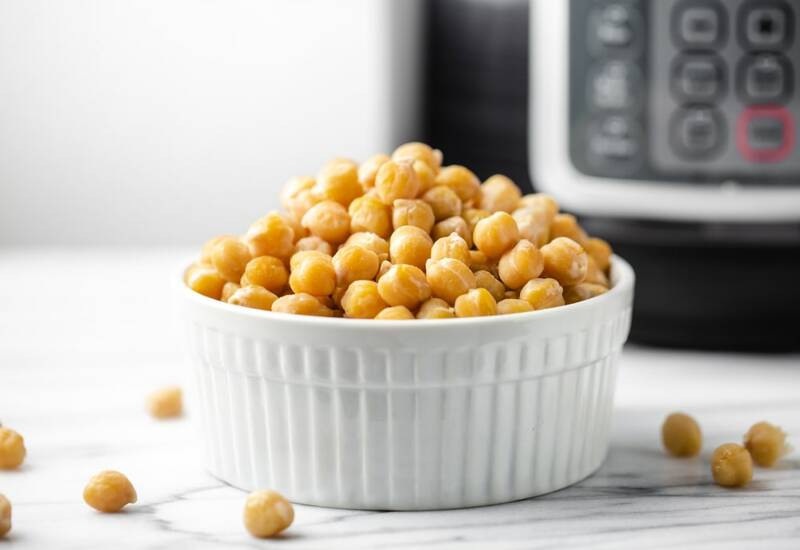 Garbanzo beans (or chickpeas) are super simple to make with a pressure cooker, and no soaking required! Just cook the beans for 1 minute in the pressure cooker to replace the soaking component. Then rinse and cook for 20 minutes... that's it! Perfectly cooked garbanzo beans are ready for your recipe in less than 30 minutes. Rinse beans and remove any stones. Pour beans into inner steel pot of pressure cooker and pour in enough cold water to cover beans by 1 inch. Lock pressure cooker lid in place and set steam vent to Sealing. Select Pressure Cook (Manual) and cook for 1 minute on High Pressure. Turn the steam vent valve to Venting to quick-release the pressure. Pour beans into a colander and rinse under cold water. Discard cooking liquid and rinse out the steel pot. Pour soaked beans back to pot and add 4½ cups water. Lock pressure cooker lid in place and set steam vent to Sealing. Select Pressure Cook (Manual) and cook for 20 minutes on High Pressure. These garbanzo beans can be used in so many different ways. Make homemade hummus or garbanzo bean salad. Add them to a soup or mash them on toast. Roast them for a crispy snack. Per Serving: 67 calories; 1g fat; 11.2g carbohydrates; 4g protein; 0mg cholesterol; 15mg sodium. This was my first time making any type of bean/legume in the pressure cooker, and I will admit, I was a skeptic at first! I'm amazed at how tender these chickpeas turned out. I thought they would be raw and undercooked, but they were perfect. I seasoned them with cumin and tossed them in a salad. Perfection! I love this recipe! I never remember to soak my beans overnight. I cooked the beans as instructed and the result was perfectly cooked chickpeas. I made hummus for a party, quick and in a pinch. Saved me so much time! Definitely going to do this again soon.